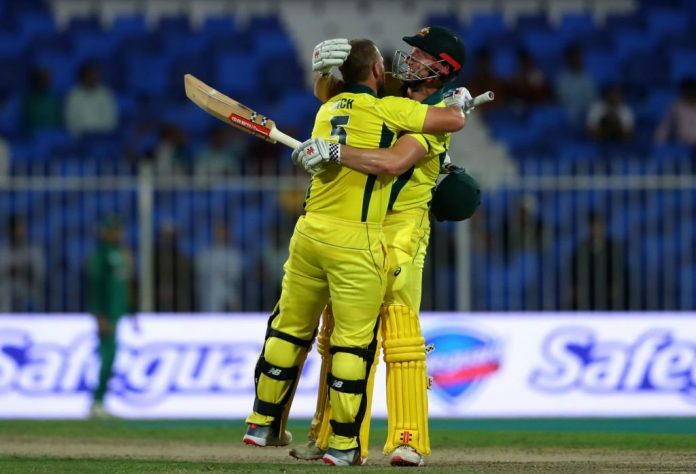 The skipper Aaron Finch and Shaun Marsh took Australia to a convincing win in the opening game of the five-match ODI series with their 116 and 91 runs inning as they chased down Pakistan’s 281 runs target at an expense of only two wickets in the 49th over of the inning. The man-in-form, Usman Khawaja looked dangerous for his brief stay at the crease, where he scored 24 runs off 30 deliveries, but failed to convert this start into something signficant before falling to Faheem Ashraf. It was then a Finch-Marsh show in the rest of the inning. Aaron Finch and Shaun looked at ease without worrying about the creeping required run-rate, knowing that they can pace their inning up and the score was not a big one. Pakistan were playing a relatively inexperienced white-bowling attack, having bowlers like Yasir Shah and Mohammad Abbas who are yet to prove their worth in the limited-over cricket. The duo made the whole Pakistan bowling line, including Mohammad Amir and Imad Wasim, look completely toothless and guide Australia comfortably towards the target. Aaron Finch fell after scoring 116 runs off 135 deliveries with the help of eight 4’s and four 6’s, but by the time Pakistan got their man, the damage was done and the visitors were well on course for a thumping win. Shaun Marsh continued his assault from the other end with his unbeaten 91 runs off 102 deliveries with the help of four 4’s and two 6’s, while Peter Handscomb provided the finishing touch with his 30 runs off 27 deliveries. Faheem Ashraf and Mohammad Abbas remained the only successful bowlers for the home team, picking one wicket each in the game. Earlier, left-handed batsman Haris Sohail struck his maiden century to help Pakistan post a good total of 280-5 against Australia in the opening match of the five-match ODI series at Sharjah Cricket Stadium on Friday. Haris paired with Umar Akmal and Shan Masood in the middle order to help Pakistan dominate in the opener of their home series. He scored 101 runs off 115 balls. Pakistan started off their inning with an opening partnership of 35 runs after being sent to bat first. A new opening pair of Imam-ul-Haq and Shan Masood gave a fair start to the men in green before Nathon Lyon pitched the ball straight outside off to remove Imam who tried to drive the ball but hit it straight in the hands of the bowler. He made 17 runs off 27 balls. Thereafter, Shan and Haris added 43 runs to Pakistan’s total on the scoreboard but they couldn’t carry the momentum for long as Nathan Coulter-Nile picked up Shan after he made worthy 40 runs off 62 balls. On his return to the team after almost two years, Umar Akmal fell just a run short to his fifty while charging Coulter-Nile but caught straight away. He made 49 runs off 50 balls. He and Haris put 98 runs together on the scoreboard for the third wicket to take Pakistan on high against the Kangaroos. Faheem Ashraf and Imad Wasim played a cameo to further strengthen the total of Pakistan. Faheem scored 28 runs while Imad made as many runs off just 13 balls. The Skipper Shoaib Malik managed to score just 11 runs before falling to Maxwell on a sharp spun delivery. Nathan Coulter-Nile remained the pick of the bowler with two wickets to his name, whereas, Jhye Richardson, Nathan Lyon and Glenn Maxwell picked one wicket apiece. It is pertinent to mention here that the left-handed batsman Shan Masood and right-arm pacer Mohammad Abbas are making their ODI debut as Pakistan have won the toss and decided to bat first against Australia in the opening match of the five-match ODI series in Sharjah on Friday.